Sweet roasted red pepper nigiri – The pepper was soft and sweet, the flavour of which was balanced nicely with a hint of wasabi warmth. The rice, as with all the Roll With Me Sushi pieces, was perfectly cooked. 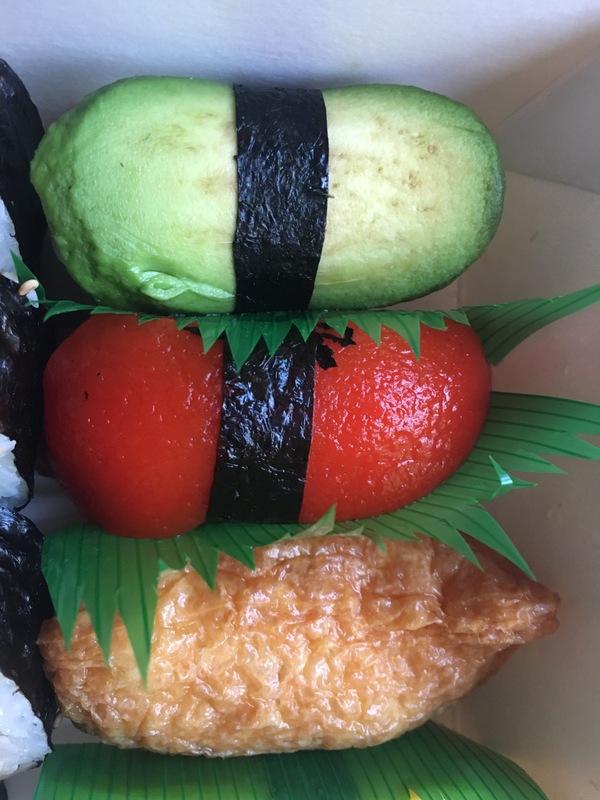 Avocado nigiri – This looked beautiful in the box, and you can see how much care was taken in putting everything together. I really enjoyed the mild flavour of the avo with the rice. Avocado hosomaki – As with the above, I think I’ve found my new favourite way to eat avocado! The rolls tasted lovely and fresh, the filling was creamy then you had the slightly more solid rice, and there was the perfect amount of each of the two. Sesame and maple roasted sweet potato maki – This was my favourite of the lot. The creamy sweet potato was so deliciously seasoned and the sesame seeds added a little contrast, along with the nori giving it the perfect balance of sweet and savoury. Veg crunch – Inside out rolls filled with cucumber, carrot, spring onion, and green beans, rolled in veganaise and crispy fried onions. 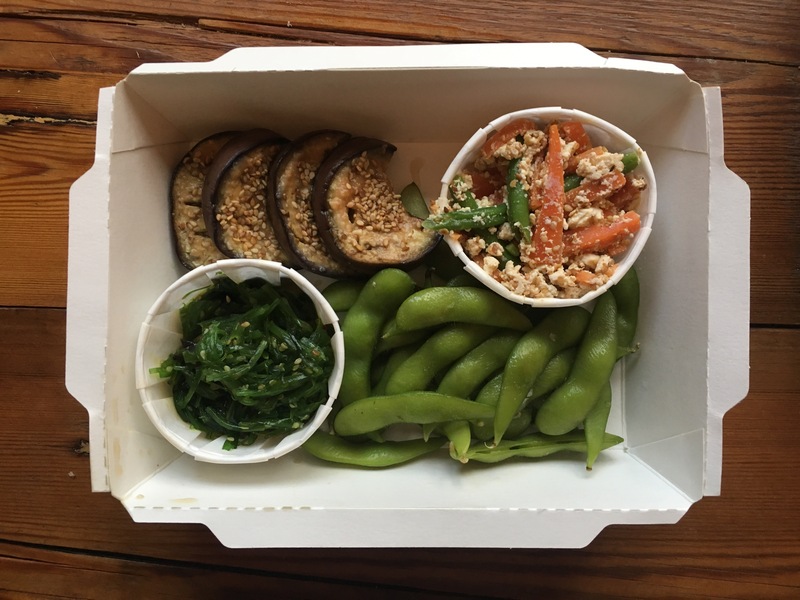 Sadly by the time I got round to eating my lunch in the office the onions were a little less crispy so these are definitely best eaten fresh, but you still got the crunch from the fresh vegetables, and the overall flavours were really good. Sesame shiitake rolls – This one was Jamie’s favourite, and a close second for me. The umami of the mushrooms made it quite meaty, and again seasoned perfectly, cooked in sesame oil with garlic, chilli, and soy sauce. I wouldn’t necessarily think of sushi as a filling meal but a few of these with a side or two would definitely do it! So yummy. Inari sushi – This is sushi rice covered with a sweet fried tofu layer, and I haven’t eaten much sushi at all so I’d never seen one before. It reminded me a bit of a sugared donut in terms of the flavour, not what I expected at all, but it was delicious – really nicely made. 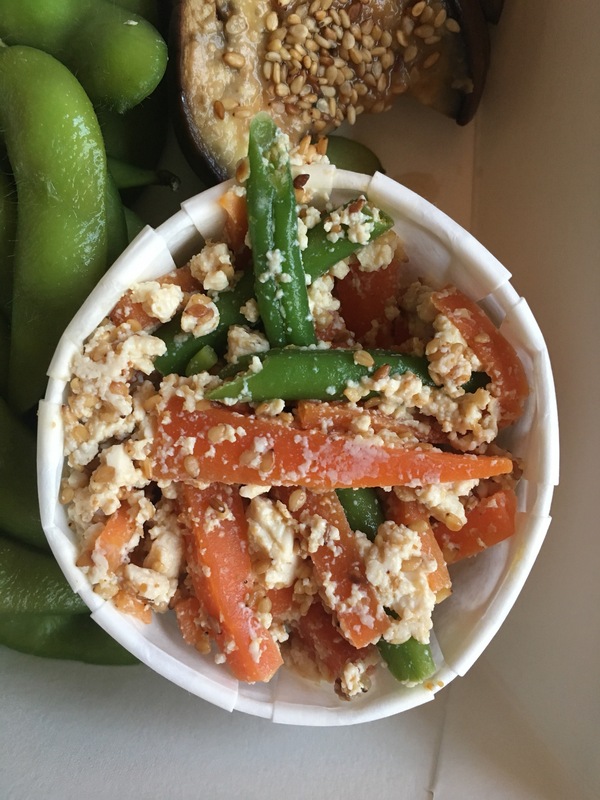 Green bean & carrot shiraae – A mashed tofu and sesame salad mixed with the two types of crunchy veggies. The tofu melted in the mouth but the raw veg still gave the dish a nice bite. The little hits of sesame from the seeds added an extra layer to the flavour and made this a really yummy side. 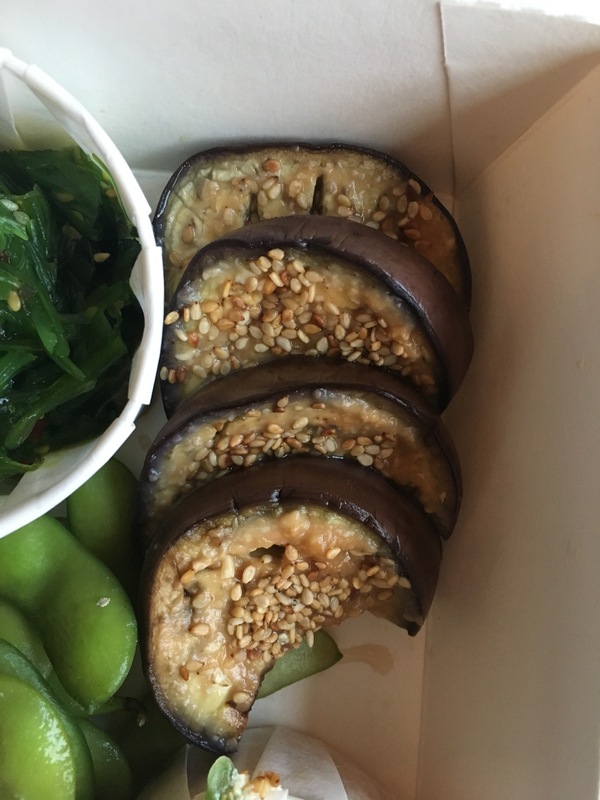 Nasu dengaku – Aubergine with a miso glaze and toasted sesame seeds. One best eaten fresh, as the slice on the bottom which had been soaking in the glaze for longest was a bit soggy. I love aubergine and often roast it with miso myself but this wasn’t my favourite of the samples, the skin was a bit rubbery and the miso was fairly overpowering (almost definitely my fault for leaving it so long before eating though). 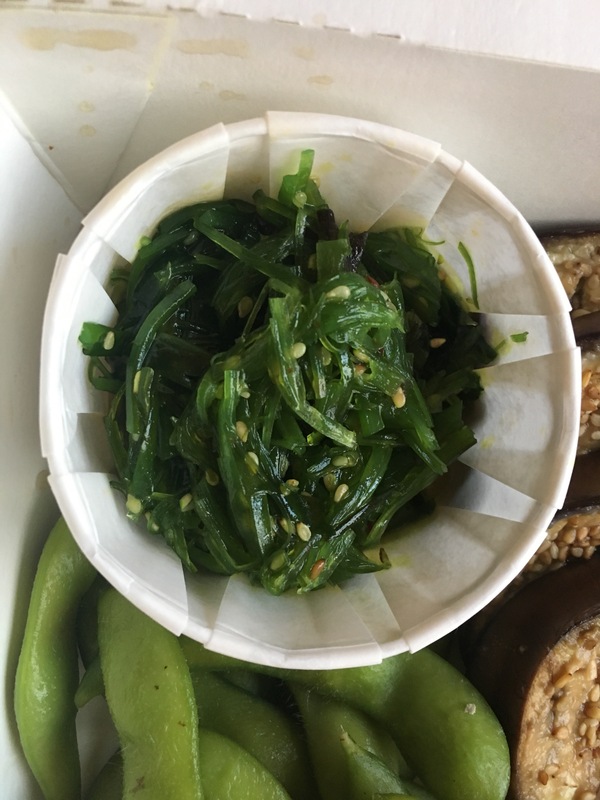 Goma wakame – This seaweed salad was really interesting, and again I hadn’t eaten something like it before. The texture was quite chewy and there was a combination of sweet and salty flavours from the vegetable and it’s dressing. I wasn’t sure about it but Jamie loved it and polished it off for me, saying he’d tried the dish before and this version was miles better. 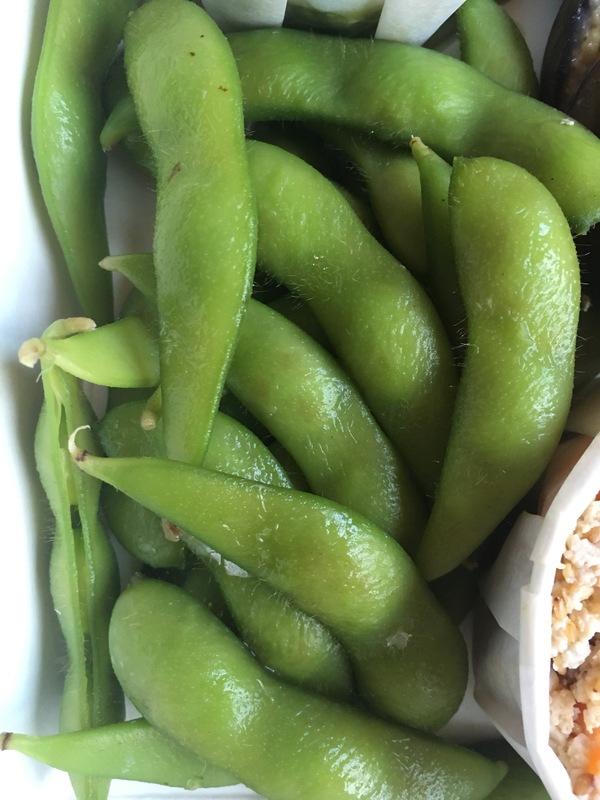 Sea salted edamame beans – I don’t have too much to add about these as they were exactly what they said on the tin, but it was a generous portion and just the right amount of salt for me. Always nice to have these as a protein-packed side. Before we ate, Jamie told me that he didn’t like sushi at all, but after trying almost a bit of everything, he said he’d definitely like to order some in the future; Roll With Me Sushi had him converted. The food was worlds away from the grim ready-to-go boxes you pick up from the supermarket, and more impressive than we’ve tasted at chain restaurants too. The rolls were beautifully put together and you can tell Sue really cares about the food. 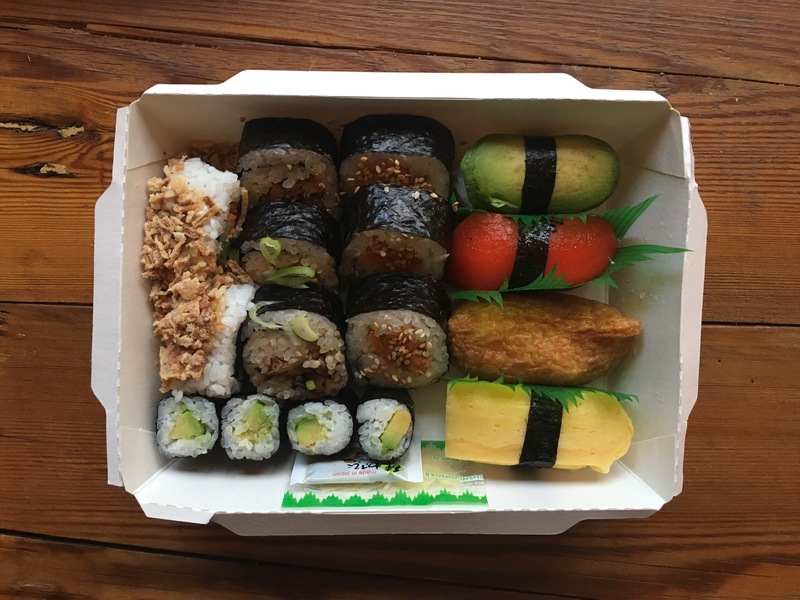 I think it’s a lovely concept; having a sushi lunch delivered to my office felt like such a nice treat, yet looking at the prices on the menu it wouldn’t be breaking the bank at all to do so. I know not everyone is a fan of sushi but if you are I would definitely recommend checking Roll With Me Sushi out. 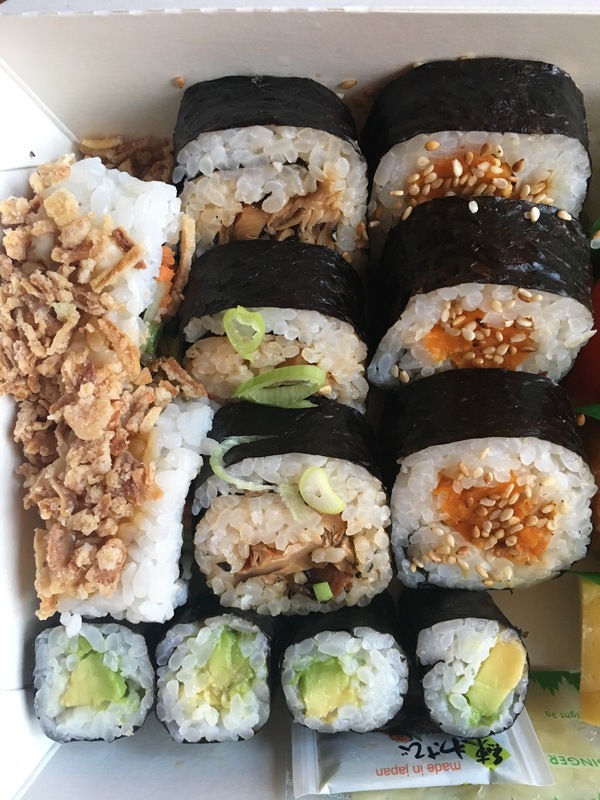 Disclaimer: Roll With Me Sushi gave me the sample platter to try free of charge for the purposes of the review, but this is a genuine and honest account of my thoughts on their food. This looks amazing, I will definitely try it!